You guys know I'm all about the flavor over here, and I love me some good healthy takeout-style meals, but I'm also all about dishes that don't take 7 days & 7 nights to make and clean up. 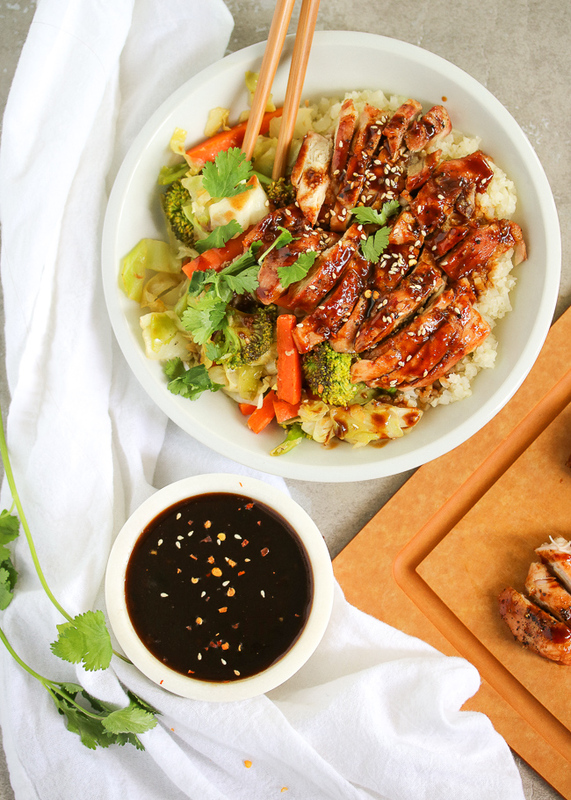 Teriyaki Chicken Bowls sound simple until you think about it for a second... scratch-made sauce, rice, veggies, chicken.. it's a lot of components. But, I promise you, I have made the process SO SIMPLE. With zero flavor lacking! Start off by baking your chicken. It's the easiest way with the least cleanup (two wins in my book). While the chicken cooks: stir fry your veggies, steam your rice (either white or cauliflower - both are so easy; see notes below), and whip up your sauce. No store-bought stuff here for the teriyaki which saves you money, but also saves you on lots of sugar & soy. And it is the easiest thing. The ingredients go in the blender, you've got a sauce. 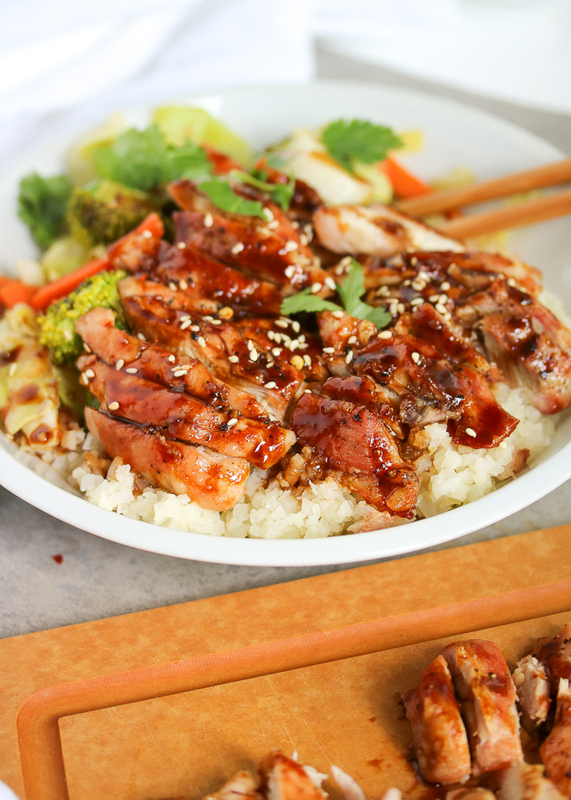 Want it thick & sticky like a real-deal teriyaki? 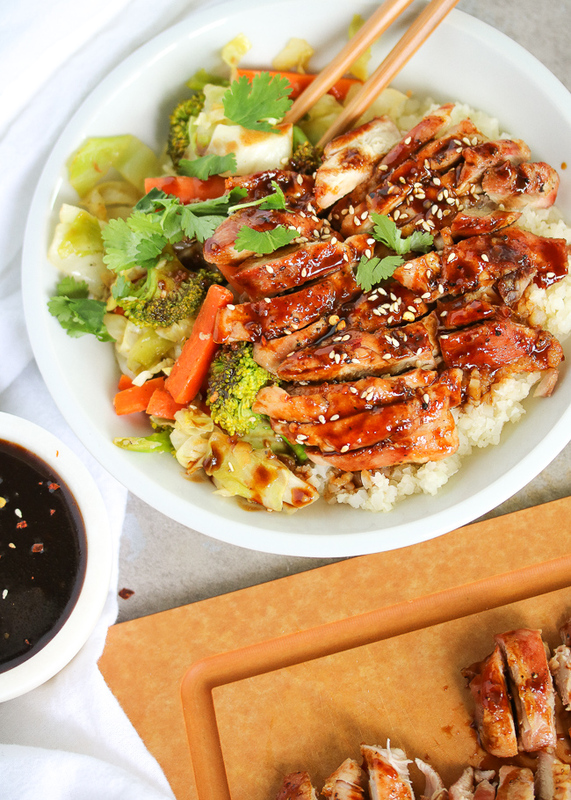 Simmer it on the stove while everything finishes cooking, and it is seriously Japanese takeout-style perfection. The recipe makes a large batch of sauce so you have plenty for drizzling extra on your bowls! If you have any left over, store it in the fridge for salads, salmon, shrimp, dipping chicken strips, etc! You could always make a double batch from the get-go to make sure you've got extra. It's SO good I could drink it. 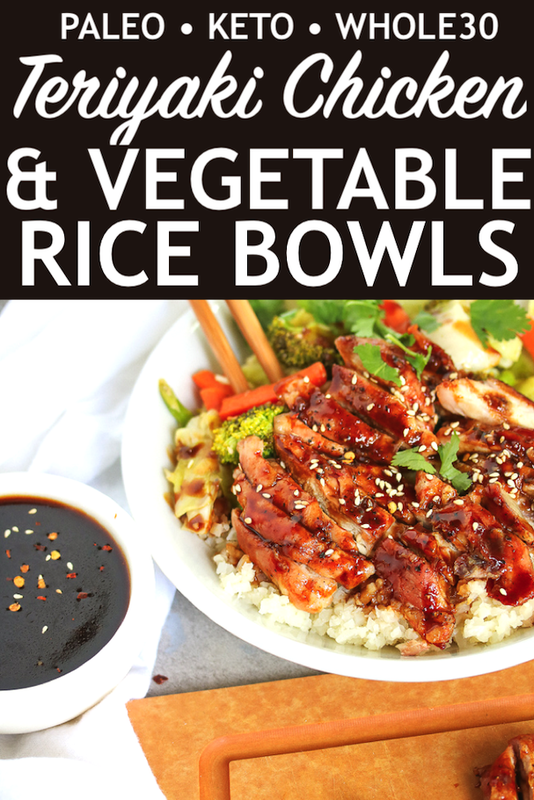 These bowls are just as good served chicken & veggie style over greens (or solo) but rice sort of seals the deal! See my "Notes" below for rice options, how I cook, and how much I make! And let me know in the comments below... are you team white rice, or team cauli rice? I go back & forth, but honestly I usually just skip them both and go straight for the meat & veggies! Preheat the oven to 425ºF. Line a baking sheet with parchment paper for easy cleanup. Arrange the chicken thighs in a single layer on the sheet. Drizzle with avocado oil & season with salt and pepper. Transfer to the oven and bake for 35 to 40 minutes, or until cooked through and the edges begin to crisp. FOR THE VEGETABLES: Add 1 Tbsp of cooking oil to a large skillet over medium to medium high heat. Add the vegetables, and cook while continuing to stir for 10-12 minutes or until all of the veggies are tender. Season with salt & pepper to taste. FOR THE SAUCE: Combine the coconut aminos, balsamic, oil, dijon, and dried ginger in a blender until smooth. Transfer to a saucepan over medium heat and stir in the minced garlic and red pepper flakes. Simmer (constantly stirring) until thickened to your liking, about 10 minutes. 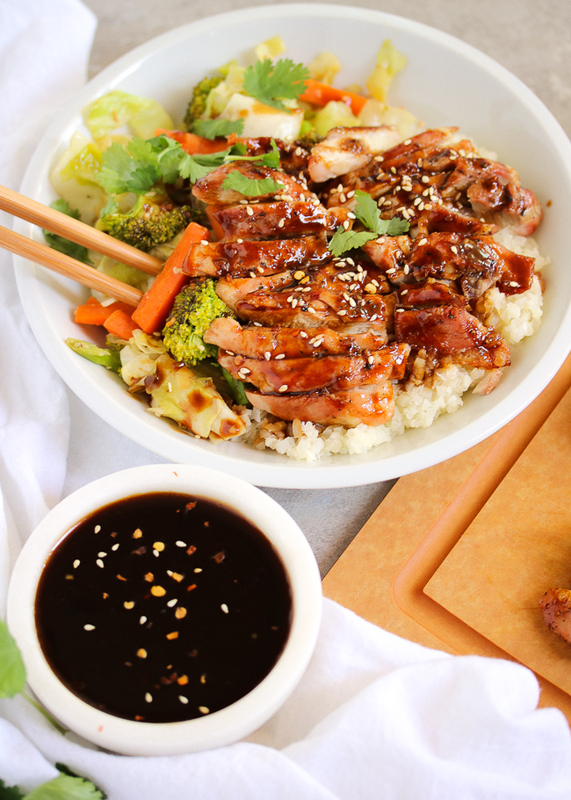 Once the chicken is finished cooking, use a brush or a small spoon to coat the chicken with teriyaki sauce. Slice before serving. TO SERVE: Scoop the cooked vegetables over white rice or cauliflower rice (see notes below) or serve on their own. 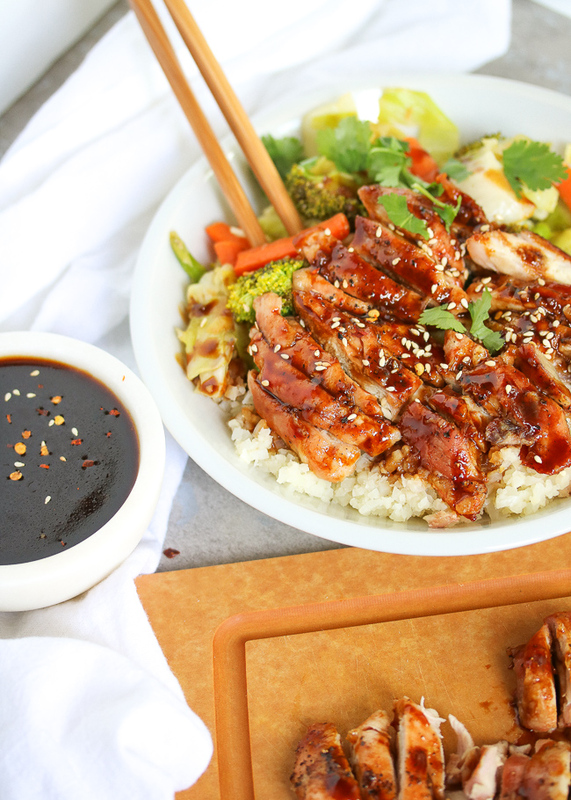 Top with teriyaki chicken, sesame seeds, and an extra drizzle of sauce. Enjoy! If using cauliflower rice, heat in the microwave or on the stovetop over medium heat until tender and warmed through. If using a stovetop method, cover with a lid so the rice will steam for 5 minutes or so. Season to taste. I make enough for 1/2 to 1 cup of cauliflower rice per person. If using white rice, cook to package instructions and keep warm until ready to serve. I make enough for 1/2 to 1 cup of white rice per person. Hi and thank you for all the recipes you share! I haven't tried this one yet, but I've been following you on Instagram for a long time and have made lots of your dishes - all are DELICIOUS! Absolutely fantastic!!!!!! Didn’t feel like chopping garlic so i just used garlic powder- and this sauce is so deliciously addictive! !